(91 outcomes.blogspot.com - October 9, 2009) - In testimony before the U.S. Senate, recent veterans, family members, and survivors told "chilling" accounts of toxic substance exposures in Iraq, Afghanistan, and at U.S. military bases within the continental U.S.
A AP story tells the story's outlines and Bob O'Dowd, a Marine veteran with the Salem News, provides the details. Among the hazards have been toxic burn pits in Balad, Iraq and throughout the military's overseas theaters of operation. Burn pits were also common in the 1991 Gulf War, Somalia, Bosnia, Kosovo, Haiti, and other U.S. operations. 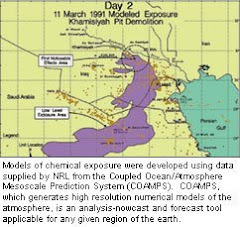 Another of the toxins the Senate heard about today was sodium dichromate, which blew in toxic "orange clouds" where U.S. troops were stationed at Qarmat Ali, Iraq. Some have sued military contractor KBR for having known about the toxin but not warned troops of its health hazard. Rhyming with DoD tactics with regards to Gulf War Syndrome and Agent Orange, a DoD (USCHHPM) report goes into detail about tests done too late to determine anything about troops' exposures, yet used by DoD to suggest there's nothing to worry about, no reason for fear, no way anyone could be sick, and if they are, there's no reason to believe it could possibly be related to troops' toxic exposures. Another of the hazards heard today in the U.S. Senate was toxic solvents that were in drinking water at Camp LeJeune, North Carolina, a base where a majority of U.S. Marines do their boot camp. A rash of rare breast cancer cases among male Marine veterans is believed to be associated with the subtly toxic drinking water. CNN's Sanjay Gupta provided special coverage on this issue. 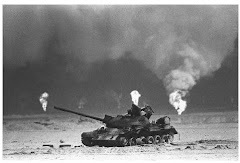 Veterans of the 1991 Gulf War have long been concerned about "never again" allowing what happened to them to happen to future generations of veterans. Yet, the U.S. Department of Defense was found to have done little if anything for this newest generation of veterans suffering from cancers and chronic multi-symptom illness, akin to veterans' experiences with Gulf War Syndrome from 1991 through to the present day.